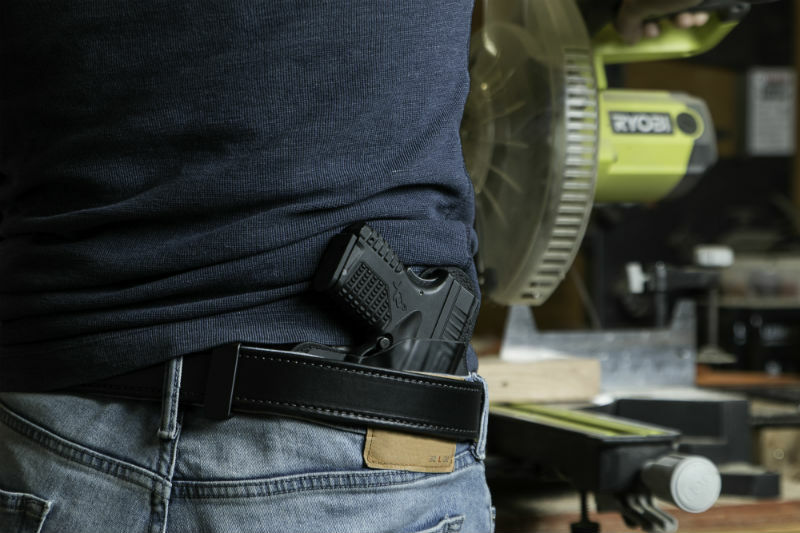 Can You Open Carry with an IWB Holster? There is such a thing as an open carry IWB holster...but it's a bit rare for a person to use one that way. It's not that a person couldn't; it's just that they generally don't. Concealment with an IWB holster couldn't be easier, since you only need to drape a shirt over it. So really, open carry just means making sure the shirt goes under it. 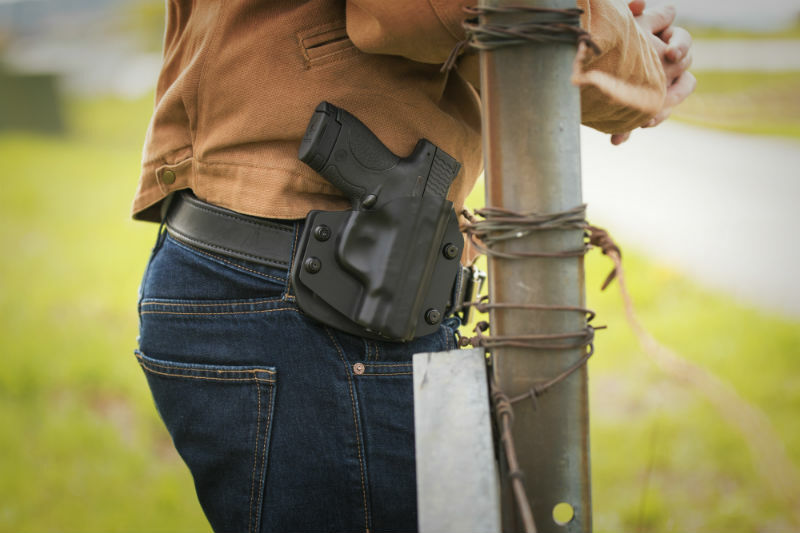 The IWB holster design is very well-suited to concealment because it's so easy to conceal. OWB holsters, on the other hand, don't do it as well with as little effort - most IWB holsters merely require an untucked T-shirt to cover up - but can certainly be concealed. In fact, OWB holsters are, in that sense, multi-purpose; open carry when one needs to, and merely throw on another layer when concealment is desired. The IWB holster format, therefore, is perfectly suited to concealment because it's so very easy to conceal. Occasionally, however, some people want to open carry with an IWB holster. It's easy enough to do. 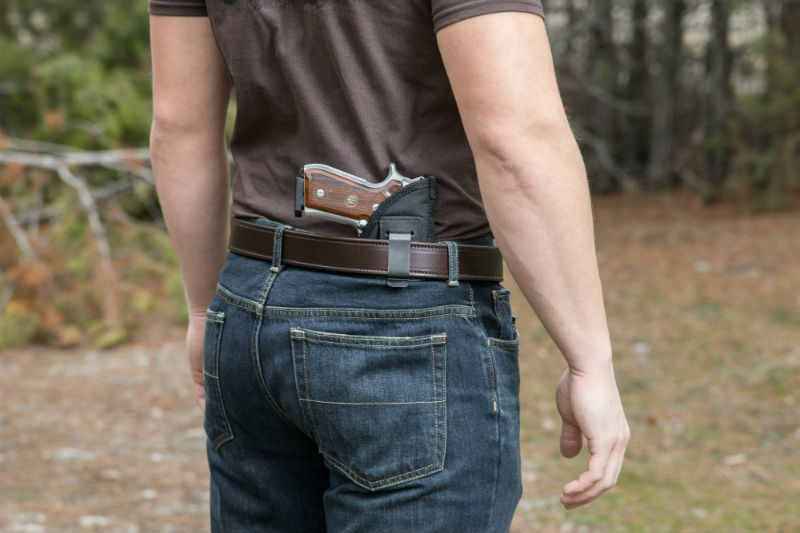 Instead of not tucking a shirt in and concealing the holster, you tuck the shirt in and there the holster and pistol sit. Or, if one's shirt is short enough to not look ridiculous, simply tuck it behind the holster and pistol. There the gun and holster sit, displayed for all to see and ready for open carry. Not that difficult, is it? To some, the IWB platform doesn't offer as much security as on OWB holster, as not many IWB holsters come with retention devices such as thumb breaks or locking devices such as trigger guard lock. That said, a number of IWB holsters come with adjustable retention, which can serve as well as an active retention device in providing a clamping force. Due to the nature of open carry laws, there are a number of states where no license is needed for open carry, and as a result some people will do so to avoid the hassle and expense of obtaining a concealed carry license. Granted, a significant benefit of getting the license is reciprocity but be that as may be, there are a number of people for whom getting the license is just too much to ask. That said, most state laws delineate the difference between open carry and concealed carry. Often enough, the difference is that an openly carried handgun cannot be concealed, covered, hidden or the view obstructed of it in any way shape or form. In other words, open carry requires the pistol to be in plain sight at all times. Why does this matter? Put simply, if one is going to use an IWB holster to open carry, then one's pistol has to be visible and stay that way. Otherwise, one could - even inadvertently - be committing a crime, by concealing without a license. Since an IWB holster is so easy to conceal, this may take a certain amount of diligence. If one is to open carry in this manner, make sure open carry is maintained. Though some people do, open carry IWB is an oddity as the IWB holster is so well suited to concealed carry. That's what most people use an IWB holster for, because it works best in that role. That said, some people like to open carry at times and concealed carry at other times. In that instance, an IWB holster can be used for both purposes. Similarly, a number of people like to have an OWB holster for certain times and an IWB holster for others. 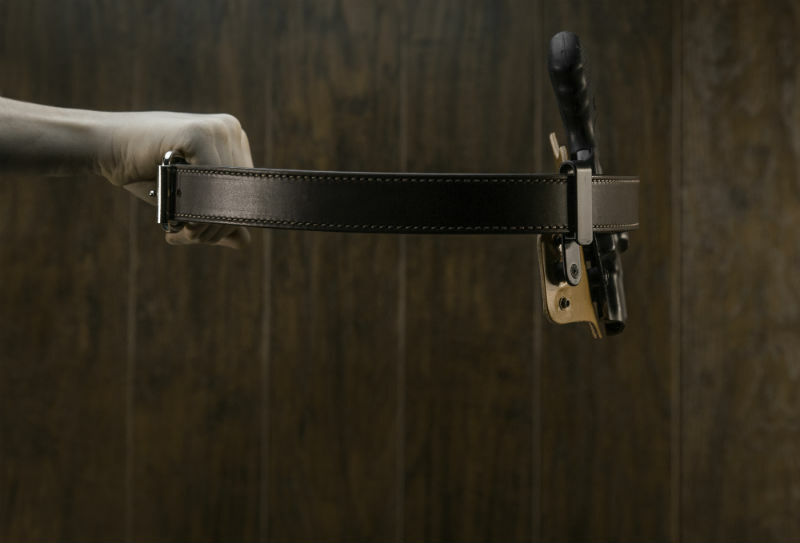 As a result, a number of holster companies have begun making convertible holsters that can be used for either purpose. A person who wishes to open carry at some times and conceal at others may wish to look into them.